In the early beginnings of Linux, Linus released the Linux kernel source in an "unusable" state, reportedly for signalling to others some work was being done into developing a new Unix-like kernel. By that time, as @RalfFriedi correctly points out, the Linux kernel was being cross-compiled in Minix. Link in Google groups to original Usenet post. (same physical layout of the file-system (due to practical reasons) among other things). So Linus was "distributing" the kernel plus some core utility programs in a diskette image format, for some more advanced users to try it out and possibly contribute. Afterwards, there were H J Lu's Boot-root floppy disk images. Which, if it could be called a "distribution", would gain the fame of being the first one capable of being installed on disk, at least by power users. 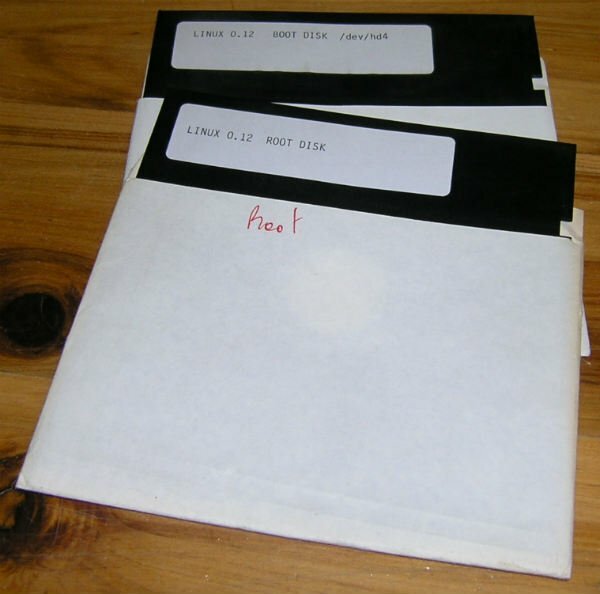 These were two 5¼" diskette images containing the Linux kernel and the minimum tools required to get started. So minimal were these tools that to be able to boot from a hard drive required editing its master boot record with a hex editor. Eventually the number of utilities available started outgrowing by a long way the diskette boot/root diskette setup. MCC Interim Linux was then the first Linux distribution ever released able to be used by (slightly) less technical inclined people, introducing automated installation and new utils such as fdisk. MCC Interim Linux was a Linux distribution first released in February 1992 by Owen Le Blanc of the Manchester Computing Centre (MCC), part of the University of Manchester. The first release of MCC Interim Linux was based on Linux 0.12 and made use of Theodore Ts'o's ramdisk code to copy a small root image to memory, freeing the floppy drive for additional utilities diskettes. To provide a simple installation procedure. To provide a more complete installation procedure. To provide a backup/recovery service. To back up his (then) current system. To compile, link, and test every binary file under the current versions of the kernel, gcc, and libraries. To provide a stable base system, which can be installed in a short time, and to which other software can be added with relatively little effort. After the MCC percursor, SLS was the first distribution offering X Window System (May 1992). 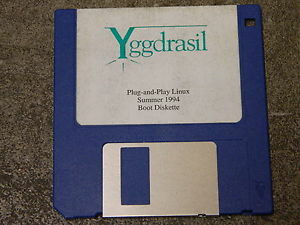 Notably, the competitor to SLS, the mythical Yggdrasil, went out later on (December 1992). Then there came other major distributors more as we know them today, notably Slackware (July 1993 - based on SLS) and Debian (from December 1993 until the first "official" v1.1 release - December 1995). PS. Interestingly enough, Slackware and Debian turn 25 years old this year. In my case (c.1994) Linux came built as images suitable for 3.5" floppies (1.44MB), probably the follow-on to the 5 1/4" images mentioned above, and each has a specific set of drivers compiled in (network, VGA, etc.). So you had to know what you needed and sort of hope that you had suitable hardware. After you booted, and could either connect to LAN or dialup via modem, then you went and found the software you needed (FTP, gopher, etc. -- this was right at the start of the "web" and search engines didn't really exist yet, so you had to know where to go or who to ask) and built it yourself. They would then build their own system, from the parts. So ultimately I was able to change the two threads, the AAAAAAAA and BBBBBBB, so that one read from the modem and wrote to the screen, and the other read from the keyboard and wrote to the modem. I had my own terminal emulation program. By the time I did this it was clear the project was on its way to becoming an operating system. So I shifted my thinking of it as a terminal emulator to thinking of it as an operating system. Edited: Removed embarrassing lack of understand of how kernels work and left the important part. The GNU userland existed before the Linux kernel did. Peter MacDonald is largely recognized as having created the first 'usable' GNU/Linux distribution. From memory of some discussions I had with him: Peter was working as a Unix systems administrator for the government and going to the University of Victoria for a Masters Degree. Peter wanted a way to work from home, but the Unix desktop license costs were prohibitive. He was already familiar with the GNU userland tools so when he saw Linus Torvalds' message on the University network he took full advantage and wired GNU tools to the new kernel. So really, the initial problem was the reverse of your question: The userland already existed and all that was needed was a kernel. Peter did not distribute SLS Linux and did not charge a fee for the software. SLS was distributed by his wife Colleen and the fee was for the expensive and time consuming process of burning CDs to mail out. Peter made a number of huge contributions to the kernel that have never been acknowledged including dynamic module loading and improved memory management. Peter has no recollection of the 'argument'/'disagreement' over installer scripts that others have claimed caused a rift that started Slackware and Debian. Linux was first started as an enhanced replacement for Minix and to understand protected mode programming on a i386. Minix came with source, and at the time there were the GNU userland utilities and the BSD userland utilities. Both were available with source. Linux tried to be POSIX compatible, so porting was not that difficult. One of the first steps was to run bash on Linux. You can consider the early days of Linux as cross compilation, the kernel had to be compiled on another system. Not the answer you're looking for? Browse other questions tagged linux kernel linux-kernel history or ask your own question. Is it normal that Fedora's yum list kernel-* shows two versions of kernel being used? How to find out which Linux kernel versions are the most prevalent? How do Linux kernel modules get enabled in a Linux distro's kernel package?